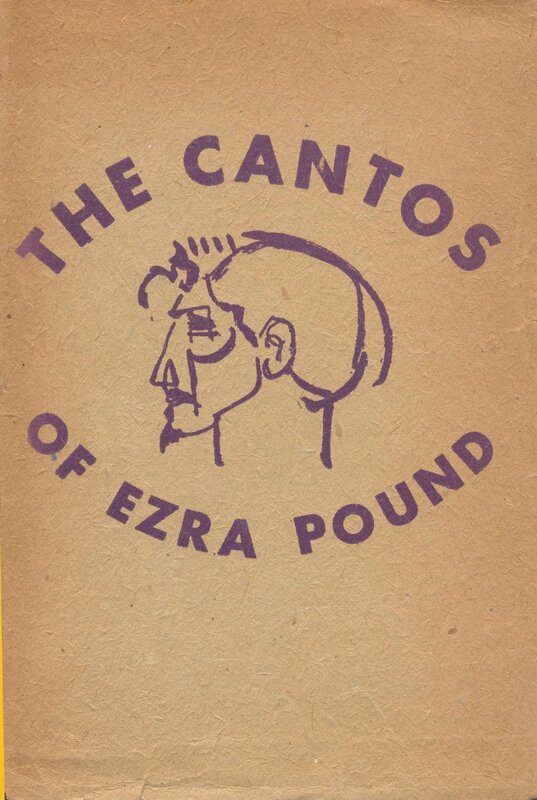 For those who don’t know, I’m writing a series of posts about Ezra Pound’s massive book-length poem The Cantos as I work my way through the poems. If you scroll down to the bottom of this post, there will be a menu where you can go back to the beginning of this series. Which is what we call, in hindsight, the original attempt by Pound at his first three Cantos, versions of which were published in Poetry magazine back in 1917, and parts of which ended up forming sections of The Cantos as we have them now (especially the first three). “Ur-Cantos” is what we call them in hindsight, but they were originally just called “Three Cantos” and are essentially Pound’s first attempt to tackle the project of the Cantos — which, even from the beginning, he seems to have planned as a major, very long poem. What survives are primarily the nekuia section of Canto III, which becomes a substantial part of Canto I, and the address of Robert Browning regarding Sordello, which becomes the beginning of Canto II (though in the Ur-Cantos, it’s the beginning of the whole thing). Yet much of the original version is gone from the revision, which makes the analysis of these poems both interesting and curious: how important are the Ur-Cantos? From what angles is it profitable to view them? After all, as Pound decreed, I am reading his poems “for profit” of a sort. One sort of profit I want is to understand how Pound conceptualized what he was up to in the beginning of the project, so insights might be available there. Also, I wonder to what degree the later versions of the poems are, in some sense, full of playful and tricky obfuscations of things that are much more accessible and transparent in the earlier versions of the Cantos. My rough recollection prior to rereading these poems was that they were much more accessible, much more transparent, and tended to work as a three-way dialog: history (in many forms), the poet, and the audience. In these poems, we find Pound a much younger man than we have so far: the Cantos I-III I have discussed in the first few posts of this series are all much later work, revised and finalized long after these original Cantos were published, and after several of the Cantos that follow them were drafted and finalized. The work is immediately more accessible, with Pound shifting not from image to image (the way he does in the final version of Cantos II and II especially, but also to some degree in Canto I) as much as from thought to thought. The straightforward and sensible explanation is that his approach to poetry shifted in the process of writing the Cantos, which makes a few things make sense suddenly: among them, the way some of the Cantos that follow are much more accessible than Cantos II and III. Is some two centuries outside the picture. Pound doesn’t just take Browning’s poetical license with the dates as a freedom — rather, he takes it as a poetical technique, a way of telling the story he wants to tell. Here, he finds the freedom to do the things he actually goes about doing in the later drafts of Cantos I-III, as well as many others: the elision or superimposition of historical figures, of events, of notions. Eleanor of Aquitaine and Helen of Troy; Malatesta and Mussolini. Were ’t not our life, your life, my life, extended? You had one whole man? And I have many fragments, less worth? Less worth? Clearly, in some sense, Pound does envision this project as an extension of his life, your life, our life. Who “your” and “our” is, well, that isn’t so clear. The remnants surviving from this Canto are in Canto II, of course, and not just the address of Browning: there is the stuff of gods in the azure air, the pagan spirit-beings and such. This poem, it is immediately apparent, is almost wholly empty of the necromantic fixation that permeates the first three Cantos in the form we saw before. Sordello is discussed not in necromatic terms, but in poetical, and Browning does not have a voice — he seems, quite clearly, to be a silent subject of Pound’s musings aloud, to his (likewise living) audience. The supernatural beings in this Canto are not seen as dead, so much as eternal, a kind of pagan reality bursting through the thing sham layer of consensus reality that hides them. The poem is loaded with names, mostly names of possible Sordello-figures for Pound — Arnaut Daniel, for one, whom Pound (after Dante) lauded as the greatest poet who ever lived in the book that was made from his graduate (MA) thesis, The Spirit of Romance (1910) — and a book I’ll mention again if I can get my hands on it. But Pound cycles through a bunch of figures: Chaucer, Boccaccio, the troubadours [Bernart] De Born and Uc de St. Circ, and Browning himself. He agonizes over form, over approach, over whom to idolize, all the while discovering the very technique he will use: refusing to choose among many, and simply superimposing them into a kind of metapoet figure, their oeuvres into a kind of metapoetry. He invokes painters (Picasso, Lewis, Casella) and goddesses (Venus and Kwannon, which I assume is supposed to refer to Kwan Yin, amid other bits of chinoiserie). Moses and Egypt, Atlas as astrologer beside Prometheus as physicist… there is a lot of jumbled business going on here, but the take-home message is that Pound has not settled on a poetical approach yet, at least not consciously… and yet, he is already doing, in a less compressed form, many of the things that will characterize the Cantos. The continues at it in Canto II, which seems to follow straight on from Canto I — in a way that is jarring in its straightforwardness, when you know how disjointed the first three poems are from one another in the final form. The poem, too, is flabby with its grammatical normality, with the weight of all its full sentences and completed thoughts. Reading a book of a hundred and twenty cantos of this sort would feel much more endless, it seems to me, and Pound’s themes and purposes seem more muddled as a result. Yet he holds up more art, more troubadour verse, and the El Cid material familiar to us now from Canto II. Catullus, a wonderfully bitter old Roman poet shows up, as does a woman named Lesbia from his poems, who begins as a lover and then ends up as the whipping-girl for Catullus’ venting after they are a couple no more — a figure of masculinity in a poem where, for all its concern with Dante (whose beloved Beatrice figured in not only the Divine Comedy but also his Vita Nova), the troubadours, and so many others, love is a marginal concern. There were not those faces, there was one face. And yet for all that, the poems are more accessible, more clear, less hermetically sealed. All of which speak to a major change in Pound’s writing — and, for the purposes of considering The Cantos as a magical libram, and Pound as a mage, suggest that somewhere between 1917, when the ur-Cantos were published in Poetry, and 1924/25, when A Draft of XVI Cantos was published in Paris. What? With half-transparent forms, lacking the vigor of gods. Slit to the elbow, slashed with various purples. Her eyes were green as glass, her foot was leaf-like. And promised him the way of holy wisdom. “Pretty green bank,” began the half-lost poem. Conversed with each, observed the varying fashion. Let us hear John Heydon! Omnis intellectus est”—thus he begins, by spouting half of Psellus. Pound immediately corrects himself that it’s not Psellus, but that’s beside the point. Said point being, as much as Pound seems like he might be mocking Heydon, he doesn’t quite do so: he calls him half-cracked, and indeed the Rosicrucian secret society in general were half-cracked in their occultism, their alchemical studies, and the lot… but it’s been argued we owe them the world we live in today, for the advances in science and freedom of thought that their work gained for us. In any case, it is tantalizing when considering the changes Pound might have undergone, that he would by 1917 be looking back towards to Heydon in a way similar to how he looked back on Arnaut, Dante, Browning, and the others. My fictional Pound is, here, at least aware of occult secret societies battling it out in the world, running their own private war under the skin of apparent world. Here Pound begins to trace the literary heritage of the Greeks backwards from English, and England, via Italy and Italian renaissance translation (and the culture that funded it), to ancient Greece, and we arrive at what becomes, finally, the whole of Canto I in the final version: the nekuia or necromantic ritual that Pound believed was the oldest and most primordial passage in The Odyssey. Here, Pound reveals necromancy for the first time. We have seen the dead, ghosts, and even a corpse dug up (in the form of Ignez de Castro) but now, we see necromancy, plain and simple… but also held at arm’s length. In a fictional telling, this is Pound interested in necromancy, believing that assiduous study might lead to such power, that wondering sense of what if? But he has not worked such magics yet, has not stumbled upon anything untoward in the books through which he has constantly rummaged fdor things to stuff into this rag-bag poem of his. This is Pound on the eve of his search for poetical form, for a way to write the Cantos; but it is also another search with a far different meaning.He rummages amid the jumbled bones of history for power, and ends up in the pages of a translation of Homer — the book so many once studied as lads, which Pound did not. The most ancient book for practical purposes in the Western Canon. A fit place to search for magic, if you’re a 20th century modernist with a creeping sense that there’s a war going on behind the lintels and curtains of the world. These poems are a snapshot of a Pound who has not been warped quite so much — not by his economics theories, not by the difficulties of writing an epic poem that “contains history” — and think of it “containing” history in the sense that a corral “contains” horses, perhaps. This Pound likely has no worked any spells. He has not joined the hidden war. He has not found those books in the strange script, and decoded them, and spoken their words on a dark night, alone in his study; he has not begun playing with a Chinese inkstone at inscribing ideograms from memory. All of that is yet to come… and the poem shimmers less vividly, if also less incomprehensibly. I’m sure a closer reading of the Ur-Cantos is possible, but at the moment, I’m more interested in what they could reveal to us about my fictional Pound. And so, I’ll leave it there.